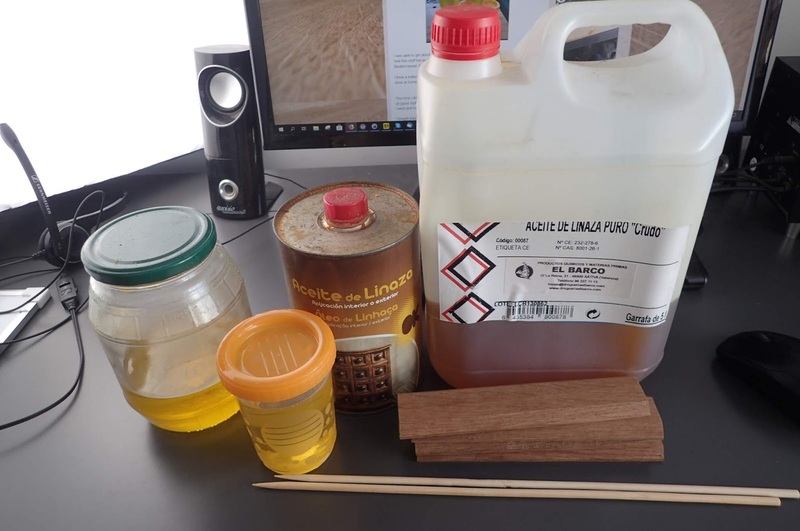 Toolerable: Different Linseed Oils Tested - Surprising Results! Different Linseed Oils Tested - Surprising Results! I love boiled linseed oil (BLO) as a finish. Also paste wax. For me, I finish 90% of all my projects with one or the other, or both. Over the years, I've tried several different kinds, with the exception being raw linseed oil. I've never used it as a regular finish. It's time to put them to a head to head test. Test material is some brown oak scrap. 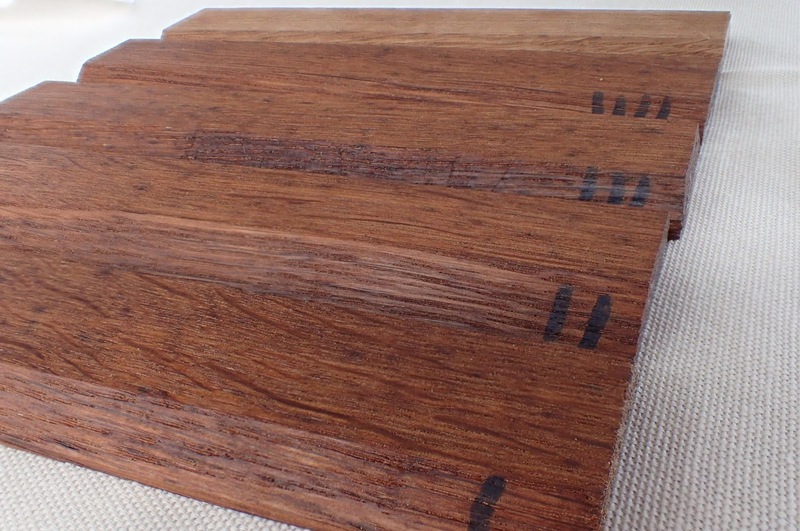 To test these finishes I used some scrap brown oak I had laying around. Brown oak reacts very well with BLO, so I knew the finish would be dramatic as opposed to using something like maple, which doesn't darken as much with BLO. 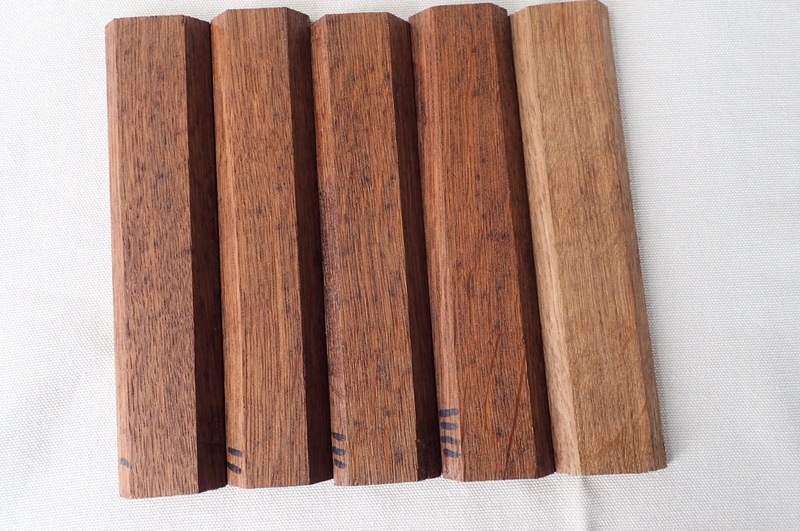 I took a single stick of brown oak and cut it into four pieces, so they all should be very similar. After cutting it and thinking some more, I decided I needed one more piece as a control. I got another piece from a second stick of brown oak originating from the same tree, only this one is a bit more quarter sawn than the others. I don't think this affected the results much. First, I should explain how I apply a BLO finish, which may or may not be how you do it. I see some people really take care in applying it, using many coats and sanding between coats. Normally all I do is slather a bunch of oil on the wood with a rag or a paintbrush, or whatever is handy. I wait ten or fifteen minutes, then I wipe off the excess and buff it out with a clean rag. It's not often I use more than one coat this way, unless there are obvious dry spots. Usually, after several months, the oil finish starts to get a bit dingy looking, and a fresh coat of oil applied the same way freshens it up. 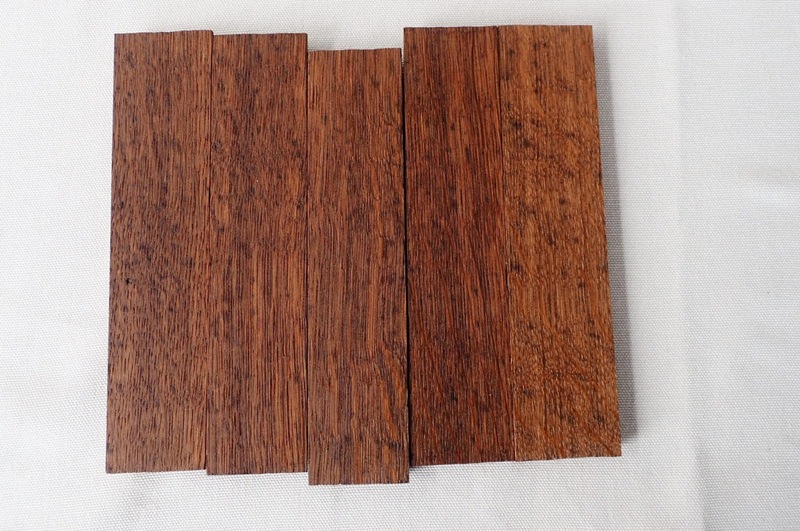 For this test, I decided to apply one kind of oil on each of four different scraps, front and back. I then waited a day or two and applied another coat, just to make sure everything was applied nice and even. The first coat of oil absorbing into the wood. All of the test pieces would eventually look very similar. The raw linseed oil would take much longer to dry. The store-bought BLO would look like an inferior finish. My home-made versions would be clearly superior in every way. Let's see if my expectations are reality. I honestly can't see the difference after the first coat. I expected all of the finishes to look about the same. What I didn't expect was that all four of them were dry enough to move onto the next step at about the same time. I've always accepted what I've read about raw linseed oil taking up to 30 days to cure. My experience here is that while the store-bought BLO was dry to the touch after buffing the fastest, the others were dry to the touch only a matter of a few minutes later. This I didn't expect at all. I also made some paste wax. 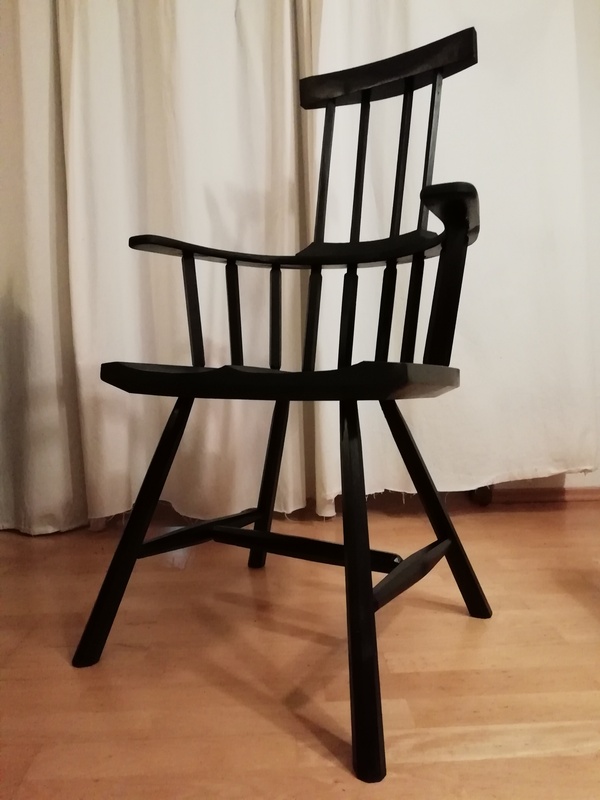 I used one part beeswax and three parts of my original home-refined linseed oil, less 10% which I replaced with orange oil to make it smell nice. 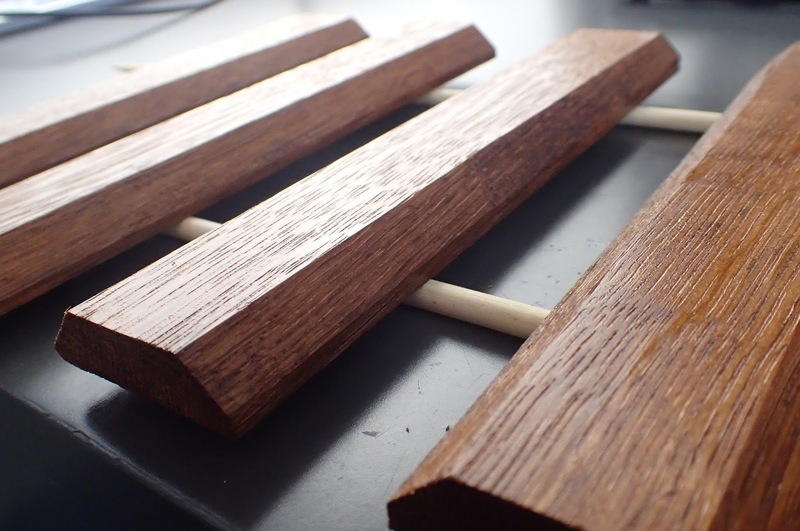 My plan with the wax was to leave one side of the test pieces finished with only the linseed oil, except for test piece #5, which is left in the white. The other side of all five sticks would get three applications of my paste wax. I apply a light coat of wax, wait about 15 minutes, then buff it off with a clean cloth. The sticks with the unwaxed sides up. Closer view of the BLO-only sides. They all look the same, except the unfinished one. The wax went on beautifully. My only complaint about the wax is that it got a bit too runny for my taste as I was applying it. For the last application, I added 1% carnauba wax to my recipe which firmed it up nicely. Next time I might try 2%. I applied the three coats of wax and left a day or two for the wax to cure between coats. I was a bit surprised that the wax darkened the un-BLO-ed piece nearly as dark as the others. Giving it some thought, it makes sense because most of the paste wax is my home-refined linseed oil. 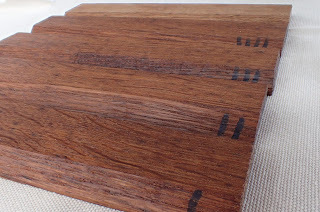 All five pieces with the oiled and waxed sides showing. The finish with the wax looks great, and feels very smooth, and has a beautiful soft matte sheen. The oiled-only side looks great, too, but feels a bit more like bare wood. 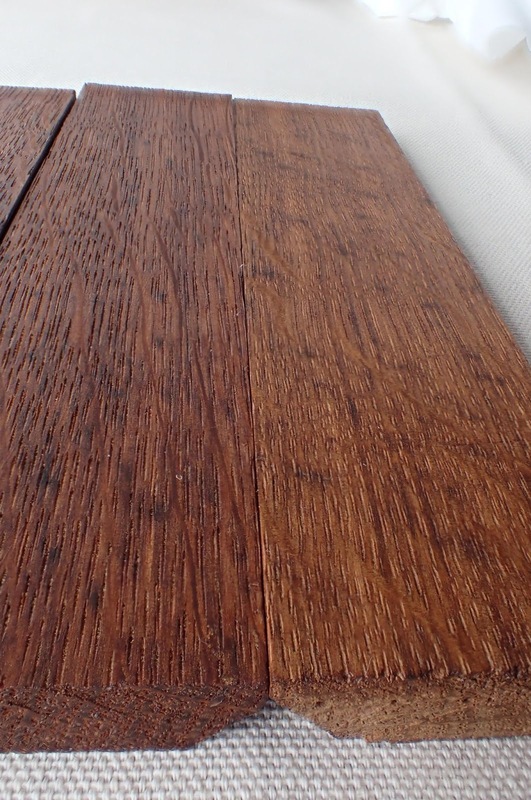 Close-up of the oiled and waxed sides. To most clearly see the differences, I took some close-ups. Home-refined oil #2 and wax on the left, wax only on the right. 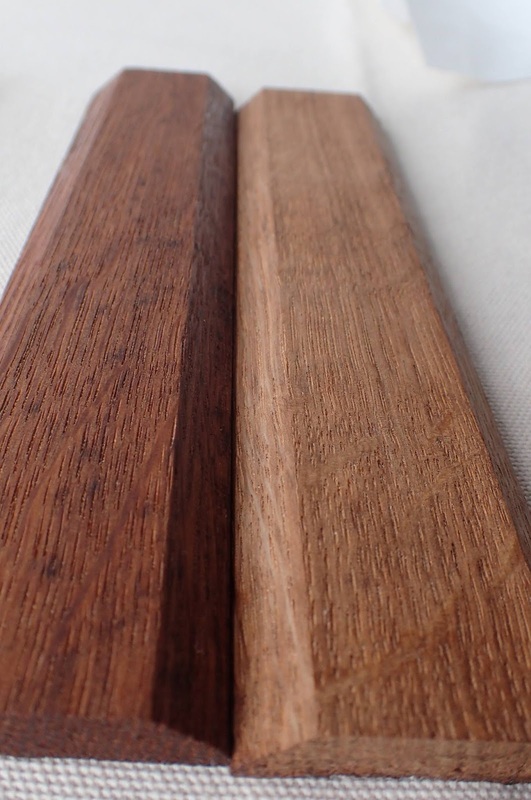 Home-refined oil #2 without wax on the left, unfinished wood on the right. What did I get out of this test? I spent a lot of time and effort making my home-refined oil, and raw linseed oil doesn't take significantly longer to dry on wood. Clearly, I'll have to use raw linseed oil a lot more in the future to see if it really is this easy. I used a high-quality raw linseed oil with no additives. It is the same thing as flax-seed oil, if you'd rather get it at the health food store. All of the finishes look pretty close to the same. If this is the only concern of yours, I'd go for the big-box BLO. The other oils are much nicer to apply and use, because they don't smell of artificial chemical dryers that make BLO stink. After a few days of air, the finish will completely cure and be odorless. If you are worried about a food-safe finish, the natural oils probably all will be safe. However, Bob Flexner says that any finish is food-safe once it's cured. I have no problem using BLO on a cutting board, but you might be more picky than me. Another bit of information I've found out since my last post, is that one woodworker used a refining process similar to mine for his raw linseed oil, but only left it to cure in the sun for one day, rather than all the months that I did. A super clear version of linseed oil might be desireable for painting, but perhaps it isn't as valuable of a quality for a wood finish. My next batch of home-refined oil will reflect this. But first, I'm going to find out if raw linseed oil will work for me. That way, I can get all the benefits right out of the jug it came in. If you have experience with BLO, sun-bleached linseed oil, raw linseed oil, stand oil, or something like that, I'd love to hear your thoughts in the comments. Raw linseed oil has been my number one finish over the last few years and I have never had any complaints about its drying time. Usually the stuff dries in a couple of days. 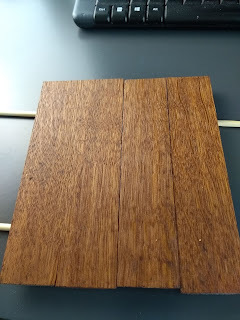 I don't like putting the finished product in the sun after the oil has been applied (which some people do) as I have found the finish becomes sticky. Maybe I dodn't leave it in the sun long enough, who knows. But in any case it is easier to apply the oil, wipe the excess off, wait a few days and be done with it. There are some spooncarvers who soak their spoons in linseed oil for several days. But in my experience this darkens the wood too much for my liking. Hey,Rudy! Thanks for the comment. Not being a spooncarver, I didn't mention it, but I think a good quality raw linseed oil would be a fantastic choice to finish a spoon. If one is worried about it being food-safe, it's a win all around. I might suggest a further test, perhaps you could eye dropper out a given amount of each onto glass (or maybe tissue paper?) and see how long it takes, and if it actually hardens or stays oily. I've also found that (American) sycamore takes on an odd color cast with flax-seed oil, which has thus far been disappointing, I will probably try out some bleached version if that would improve because I think it's a great wood for figure in small items like spoons. Hey Jeremy! Not being much of a spooncarver, I hadn't thought of the taste that linseed oils would leave behind. The test with glass is a good idea. I'll try that and see what happens. Great writeup and conclution on the oil series, thanks! 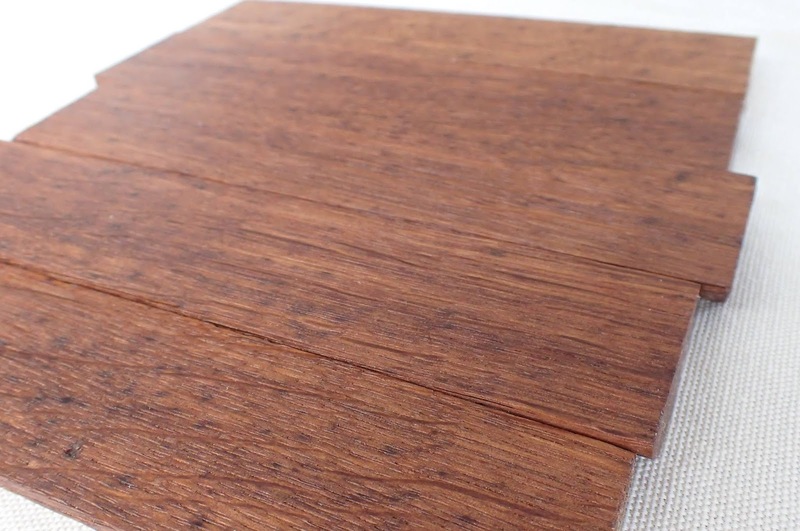 One question: Have you tryed the oils on lighter colored wood? Would be interesting to see if the bleached oil colored them less than the raw or boiled oils. Hey Ty! My guess is that it likely won't make a big difference. However, I thought the results of this test would be different than they were. But, in my mind it makes sense that if a wood will darken if it's wet with water, then it will with BLO, too. I find your research superbe. I am really not a BLO fan because of the damn smell that takes days to evaporate. Living in Quebec, i can't put the parts outside; takes alot of time to "cure" and get rid of the smell. I started also to use RLO and Wax. Don't think i will go back to something else, even if the finish is not as hard as a Minwax oil, Danish, polyurethane. Also i have a question: your percentage of Carnauba is calculated over the whole weight/volume ? Do you have numbers...? 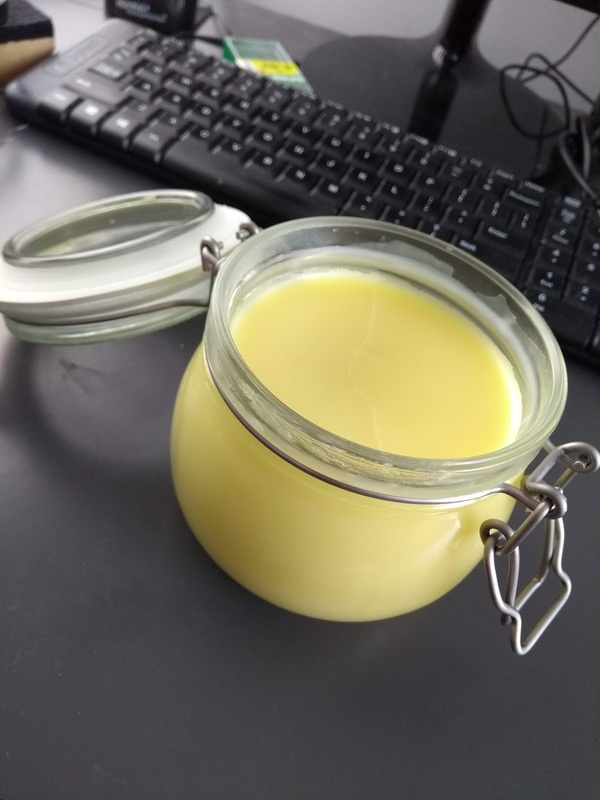 I bought RLO, beeswax, and carnauba to make my own. Finally; when i apply Shellac, i always have drips and i find that it's super sitcky. If there is a drip on one side after doing another one, i can't take it off by brushing it again... It's starting to be my less favorite product... Any comments? Thank you for all! Hi Ikust007, thanks for the nice comment! None of the linseed oils that I used leave a hard or durable surface. If you are happy with raw linseed oil, there is no need to try the others just for that. I'm sure raw linseed oil will make a fine paste wax. From what I can tell online, no one seems to do it the same way. I made my recipe by weight - I used a kitchen scale to measure it out. My entire batch wound up being 400 grams, and I just added four grams of carnauba wax. I would play withe the amount. My next batch will have twice the carnauba wax. Just don't put a lot in. My first reaction was to add it 50/50 with beeswax, but carnauba wax is very hard. I think it doesn't need much. I have very little experience with Shellac. I think if there are drips in your finish, you might be stuck with having to sand them flat before adding another coat. Good luck! Let me know how you like the wax. Hi Brian, great post! I want to know how they behave when they get older. What i don't like on BLO is the yellow color on the lighter woods after a few years. Yes, in my experience linseed oils tend to get a bit dull over time. I have noticed that a reapplication at this point can refresh the look, even if a wax has been applied over the top of the oil. I'll keep these around and see what they look like in a few months. 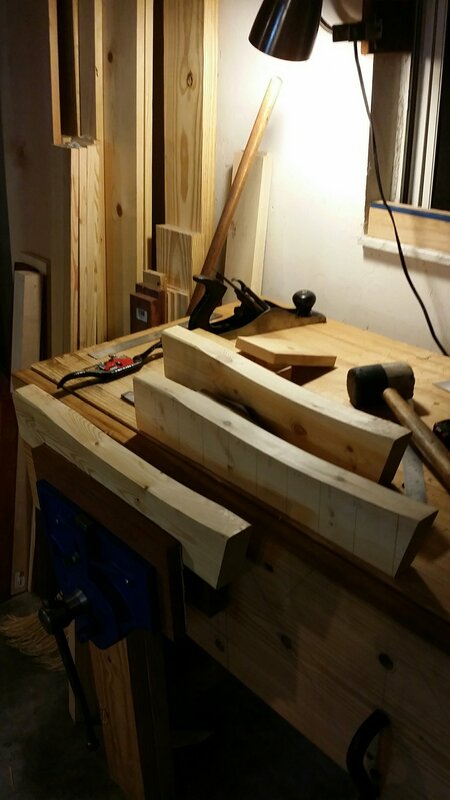 I have some sycamore laying around. Perhaps I'll do another BLO test like this on that to see how it fares with a light wood. I think there's a difference between "dry to the touch" and "cured." But I need to go review my chemistry before I say for sure. Hey, Jim! I think you likely are right. My experience with linseed oils is that they usually smell for a month or so before becoming totally odorless. Something must still be happening. 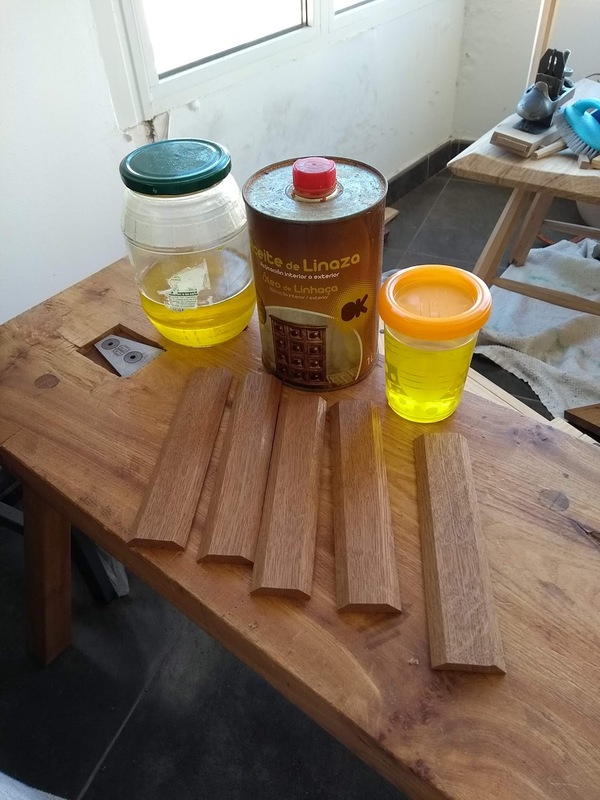 But, for all practical purposes, a fully cured linseed oil doesn't leave much more protection than bare wood, although it does seal it somewhat.